Males from the Japanese city of Osaka will host the World Expo in 2025, after getting the nod ahead of cities in Russia and Azerbaijan. The expo is expected to attract millions of overseas visitors and showcase how men can manage an event without the help of any females. 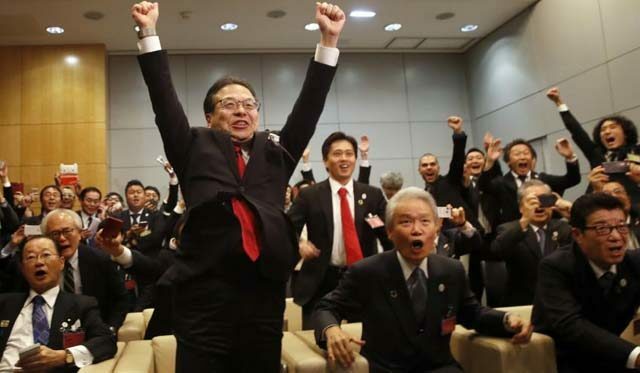 Shrieks of joy from over 100 Japanese men crammed into a small room could be heard throughout the Paris auditorium after the 170 member states voted in favor of Osaka. “MEN!! !” shouted Japan’s male economy and trade minister Hiroshige Seko. Japan’s prime minister, Shinzo Abe, who is also male, said in a statement that the country will make “an utmost effort” to fill the volunteer quota with “attractive young females”.